Light Steel Frame Home in Lake Michelle, Noordhoek, Cape Town. Initially, the 750 sqm home was designed to be built in brick and mortar back in 2017, but with the looming threat of drought and the uncertainty of having adequate water to construct the residence, the owner decided to research alternative means of construction. Working their way through the maze of Agrement Certified methods they eventually decided to select LSF as the medium and had to find a reputable LSF contractor. This was no mean feat, with a range of contractors all claiming to be masters in their field bombarding us with technical jargon. Our chance meeting with Charl van Zyl from Rancor was fate. From his initial introduction and project overview discussion, I knew we are on the right path. Charl systematically explained the system, the benefits, modularity and expansion options should we consider to additions in the future’, explains the owner. Throughout the discussion, it became clear that it is possible to have a greener home with far superior insulation properties than what is offered by the traditional building option, with reduced heating and cooling costs a major benefit. Rancor, the main contractor, is an exceptional company to work with – both Charl van Zyl and Mark Barrows are highly trained and executed their portion of the works with precision. Their dedication to the project was second to none, they had supervision on-site every day, the works were done according to schedule and they assisted the sub-contractors when needed. The light steel wall frames and floor joists were manufactured and supplied by Pholaco, a Cape Town based LSF manufacturer. With the benefits in mind we embarked on finding the right solutions to not only insulate but also manage the thermal properties within the home, ISO-board was installed between the vaulted exposed trusses, 102mm Cavity Bat was used throughout all the walls, and 160mm soundproofing in all bulkheads and flat ceiling areas. Flooring was done with light steel frame joists at 300mm spacing supporting 12mm fibre cement board supplied by Marley Building Systems, on top of which a 90mm thick structural screed was cast. Special 50mm thick sound mats were installed inside the joists which also allowed for all services to easily run in between the joists to the soundproofed wall assemblies. ‘We also decided to install solar power for the home in order to be less dependent on Eskom/Council supply. After numerous interviews, we selected a system which allows us to run all the lights, dedicated plugs, geyser circulating- and pool pumps from the system. Apart from having a 9 kWh backup battery we also produce enough energy to push it back on to the City of Cape Town’s grid, by means of an AMI meter, and we get paid for that’ explained Gilson. To get all this power from the source to the outlets required approximately 4km’s of conduit and close to 20 km’s of electrical cable to all the power points! Plumbing was also a concern, seeing that Cape Town faces a severe drought we decided that all geysers should circulate warm water to all points constantly, a balanced loop system was installed with circulating pumps, thus providing warm water immediately with no wastage of this precious resource. 12mm thick OSB board was fixed to the LSF wall panels, and covered with Tyvek vapour permeable membrane. 20mm top hat galvanized steel sections were installed as battens, to support Marley’s fibre cement planks used for external cladding. The windows, sliding doors and folding doors were supplied and fitted by Cape Glass and Aluminium. 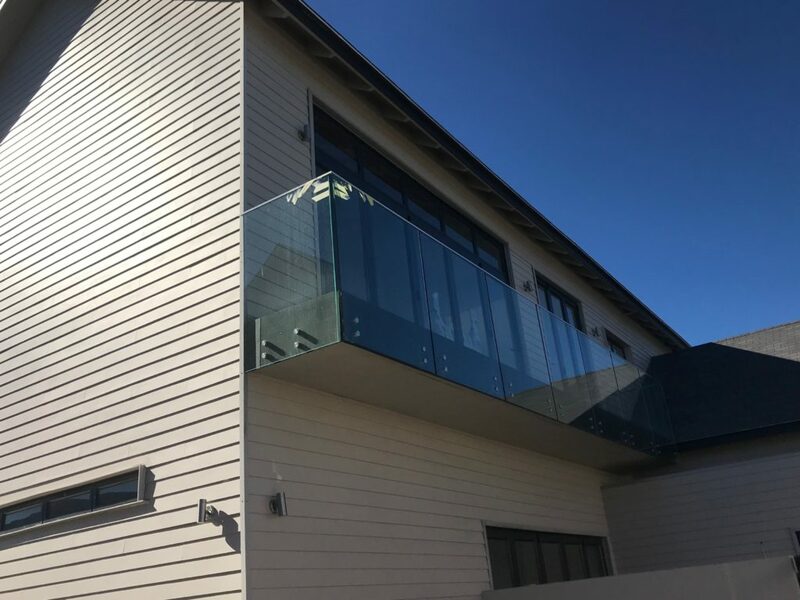 The biggest “YAY” moment was when the team installed the 12750 mm unsupported cavity sliding door, split into three sections, thus allowing an unobscured view of the garden, swimming pool, and lake. The swimming pool built by Rancor boasts an inline deck system with circulating tank refilling the pool constantly when utilising the pool. The pool is covered by a 76mmx38mmx4mm aluminium subframe and covered by wooden decking boards. It opens and closes by means of fingerprint recognition controlled from inside the house. When closed the “deck sits over the pool thus affording high security for children playing in the garden and when open slides next to the pool, thus not losing any garden space.